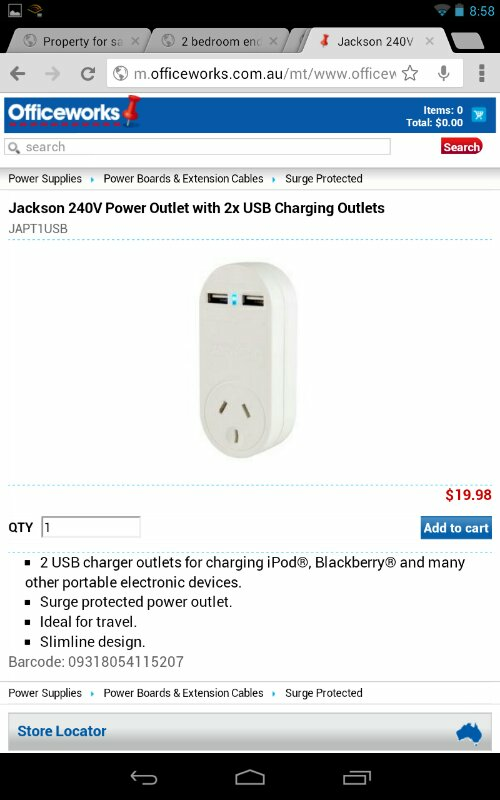 I recently bought a Jackson USB power /charger and have just been charging my son’s and his friends ipad in the USBs. The iPads started beeping about every second after half an hour or so. After a lot of restarting etc I checked the supply and sure enough the blue light on it was flashing on and off in the same rhythm. I unplugged the iPads and the beeping stopped, so it looks like the supply was switching on and off. When I went to unplug the unit from the wall it was very hot! My guess is that the two iPads were causing the charger to overload despite the 10A rating. Thankfully the unit was protecting itself by switching on and off but who knows what would have happened if I had been out and just left them plugged in! Not sure whether this is a fault with mine or a general problem but please take care. It’s worth noting that I have had iPad and iPhone plugged in previously with no problems. Two iPad devices would draw well over the rated current of this charger (1 Amp), which would cause the overcurrent protection on the charger to activate. The overcurrent protection is calibrated to activate well before a hazard could exist, and this is all tested as a part of our QA procedures, so we can confidently state that at no time would there have been any risk to you. Even with this protection in place, we do recommend that you do not attempt to exceed the rating, as such we would suggest only connecting 1 iPad at a time to the device. I think their last line summarises this nicely.